Getting around on college campuses can be difficult. They are often huge, poorly planned and require a student to walk long distances. Longboards are the perfect way to overcome this. The best decision I ever made was buying a cruiser board to get around my university campus. No more getting late for class or long walks to Uni. 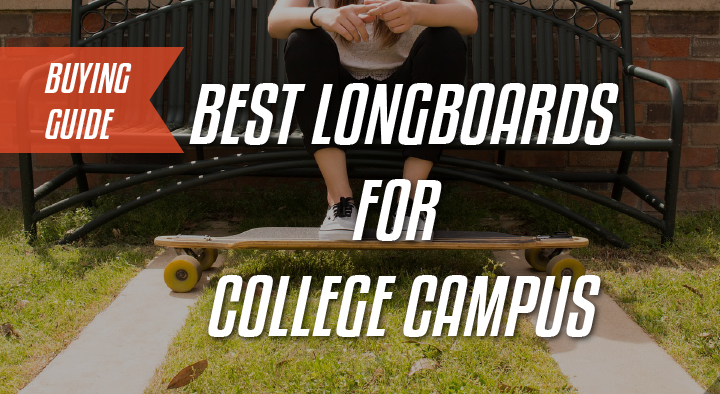 In order to get the best longboard for college, you NEED to read this guide because not all longboards will be suited for a campus. This guide will help you understand why and what makes a good longboard and highlight a few boards for you. This compact cruiser comes in at 25.6in in length and 6.75in in width. It has 7in Gullwing Mission trucks and 59mm, 78a wheels. These wheels come with Abec 5 Grease ball bearings inside them. (good option for heavier riders). It also features a single kicktail designed to help you get down curbs or pick up the board. Paired with the kick tail, this board has great maneuverability. This setup is perfect for cruising and maneuvering in and out of crowds. Its size is about the same as a Penny Nickel, meaning its a compact board that will be easy to store. However, its size might be too small for some – an alternative will be the Santa Cruz Rasta Lion which is larger. If you can handle the size, its a great option. At 44in this board is huge! It features a deck made from a 7ply lay up of bamboo and maple. This combination makes the deck flexy which increases comfortability and absorbs shock from rough roads. The deck has a raw finish which leaves exposed bamboo adding to the overall aesthetic. I really like the simple design. The skateboard has double kicktails, 6in trucks and tall 70mm wheels. The tall wheels ensure that you can roll over any road imperfections whilst also providing dampening for a smoother ride. The trucks are reverse kingpin trucks which are the most ideal for cruising. This deck is a joy to ride and is well suited for college campuses. If anything, one might find that it is too long. The length reduces its maneuverability and it might feel slow to turn, however this also makes it really stable. Take a look at the other setups mentioned, the Santa Cruz one is slightly shorter and pretty stable. This drop through board comes in at 40in long and 10in wide. Drop through means that the trucks are mounted on top of the board. This truck mounting + the long length make the board stable, as well as easy to push and balance. This will make it super easy for beginners to learn on this board. To make it sturdy and stiff, the board has been made with 9plys of maple. This also means it will be slightly heavier. The setup comes with 10in trucks and 75mm, 78a wheels. These super tall wheels will roll over anything and the wide trucks will provide a good balance between stability and maneuverability. Its clear this board is built for stability and sturdiness. If you have to do skates longer than 5 min, this board is for you. The lower centre of gravity and width of the board will make it comfortable to skate on. If this board is too stable for you, take a look at the Sector 9 Steady setup for something feisty and nimble! What makes a good longboard for campus cruising? When considering a longboard for college, you need to look at a few things. 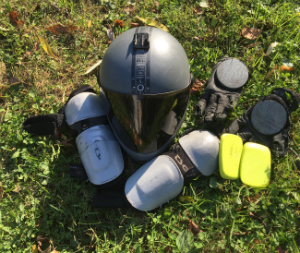 Firstly the equipment that makes up your setup and how much you’ll be skating. These are important to maximise your enjoyment of the longboard. If you have to skate 10min to get to University/College, get something that is comfortable to push further on. If you have to carry it around most of the day, something smaller would do. Something you can handle in terms of weight and size. If its slightly heavy you can get used to it but if its too heavy it will always bother you. The board size is something that can be managed, so if you don’t mind something huge, go for it. If you need to dodge loads of people, get a smaller board for maximum maneuverability. All in all we are all different, so from the list below decide which factors are important to you and your needs. For example, I like short cruiser boards that are wide and comfortable to stand on. I have big feet but like the maneuverability of small boards. Reverse kingpin trucks (RKP) are better than traditional (tkp) for cruising but either will do. The RKP are better for smooth turning and maneuverability. Maneuverability is determined by how tight the turning circle of the truck is. Typically, the wider a truck is the more stable it will be. However this stability comes at a price, the wider it is, the less maneuverable it will be. A 10in wide truck is a good balance between stability and maneuverability and trucks narrower than that will be less stable. However, you can always tighten up the trucks for more stability. I would suggest going for a narrower truck and tightening it up. You can loosen it as your skills and balance progresses. If you had to replace a piece of the board, I would suggest you replace this first. After-market trucks are often better engineered. Wheels – pebble myth busted! Typically, the taller a wheel is the better it will be at rolling over road imperfections. This is super useful in cruising to keep the ride smooth and steady. Wheels 65mm + can roll over most pebbles. However taller wheels will be slightly harder to push (harder to accelerate). Most cruiser wheels come in at 78a hardness, so softness is an almost negligible factor. However, the softer a wheel (lower the number) the more shock it will absorb and smoother the ride will be. I like large soft wheels on my cruiser setups. I personally think that wheels between 65mm and 70mm are perfect for cruising. Price is usually reflective of quality. However, you should not invest in something too expensive when you don’t have much experience skating. This is because you won’t be able to appreciate the quality of the longboard and why its so expensive. Premium longboards (like these) will make your riding experience a whole lot better, a cheap one will come with cheap trucks and make your experience overall pretty poor. I suggest buying two different boards and experimenting to see what you like out of each. If you like a board and it fits all your criteria, don’t let price hold you back. Pick the deck shape wisely! The deck should definitely be to your liking in terms of image. People will see you around on it so it better look good! Typically, tiny boards will be harder to stand on/balance and wider boards will be easy and more comfortable. Longer boards won’t turn as quickly as shorter ones but will be more stable. Lastly, some boards have flex and this helps them absorb road vibration for a more comfortable ride. Not every board will be perfect and you’ll have to compromise on a feature or two. As you buy your board for college, its going to need a bit of maintenance – as you’ll use it every day. I recommend buying some bearing lubricant and cleaning your bearings every 2 months or so. This will keep your board rolling consistently and prevent your bearings from locking up. Finally, I recommend buying a skate tool so you can tighten and loosen your setup. This will allow you to figure out how you enjoy your trucks. With all this information you are armed with the right tools to pick the right board for you. If you are still undecided I recommend going for the Santa Cruz Drop Thru, its perfect for a beginner. If you have more experience, the Sector 9 Steady is a good choice. Don’t stress so much about your first board, it took me 3 boards to truly understand what I wanted out of my setup. I am now absolutely in love with my current cruiser board. Once you’ve skated a bit, come back and read this, the information will make a lot more sense.